Clear the Stormfists out of the meadery. Stormfist soldiers ransacked Voljar's Meadery and slaughtered the family—all because they wanted free mead. Haraldar's wife was one of the Voljars killed in the attack. He wants to reopen the meadery, and he recruited his four brothers to help. Find the recipe book and herbs inside the meadery. Get spices from the storeroom. Defeat the giant who is agitating the bees. Collect appleblossom honey from the barn, and search for Bjoruld. I should help restore Voljar's Meadery. Fens asked me to speak to his older brother, Haraldar. He's by the farmhouse. Haraldar asked me to check out the meadery and make sure the place was safe before him and his brothers follow me. I'm inside the meadery. I need to locate the recipe book and some fragrant herbs so Haraldar's brother can start making mead again. Haraldar also asked me to collect some rare spices from the storeroom on the meadery's upper floor. The Snowpeak brothers now have access to the meadery. Once I turn over the recipe book and the ingredients, they should be able to start making mead again. I should talk to Haraldar and see what other help he needs. Haraldar asked me to help his brother Roruld, the new master mead crafter. He's having some kind of trouble that involves bees and giants. Roruld asked me to get rid of the giant that's frightening the bees east of the meadery. He suggested I kick a beehive to use the bees against the giant. He even splashed me with something to make the bees leave me alone. I killed the giant that was frightening the bees and collected its toe. I should bring the giant's toe to Roruld back at the meadery. Roruld Snowpeak asked me to grab a barrel of appleblossom honey from the barn. He also asked me to keep an eye out for his twin brother, Bjoruld. He's supposed to make a delivery to Windhelm, but no one has seen him lately. I collected the appleblossom honey from the barn. I should bring it to Roruld so he can make more mead. Roruld Snowpeak has been crafting new flavors of mead. He wants me to try his latest concoction. Finishes quest I woke up after sampling one of the new meads. 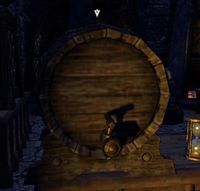 Now that Voljar's Meadery is back in business, I hope Haraldar feels he honored his wife's memory. I should talk to him.